This report reveals areas where providers will be targeting their spending to make mergers, acquisitions, and partnerships successful. With healthcare moving toward collaborative care and capitation, organizations have to face the future with a wider care-delivery footprint. 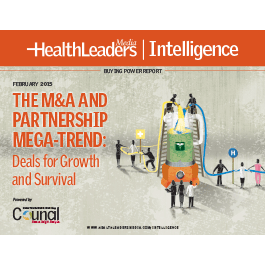 This report shows why merger, acquisitions, and partnership motives must expand beyond growing market share and revenue to include gaining the skills and scale to excel at population health management while at the same time enhancing positioning with payers at the negotiating table. What are the top areas where healthcare leaders are investing their dollars to make their mergers, acquisitions, and partnerships successful? What specific steps did LHP Hospital Group takes to merge cultures when stand-alone hospitals were brought into its regional network? Which care settings are likelier to feel the effects of payer actions, driving them to enter into agreements that provide additional strength in payer negotiations? How did Nanticoke Health Services and Beebe Healthcare partner to develop oncology services – and both achieve increased patient volumes? What are the top financial and care-delivery reasons behind today’s hot merger and acquisition activity? Why did Conemaugh Health System abandon plans to form a regional network and instead seek a larger capital partner?